Popcorn Party Favors | Main Street Popcorn and Fudge Co.
Request 2 colors for the custom label. Popcorn Party Favors are perfect for baby showers, weddings, bridal showers, graduations, birthdays, or any celebration. 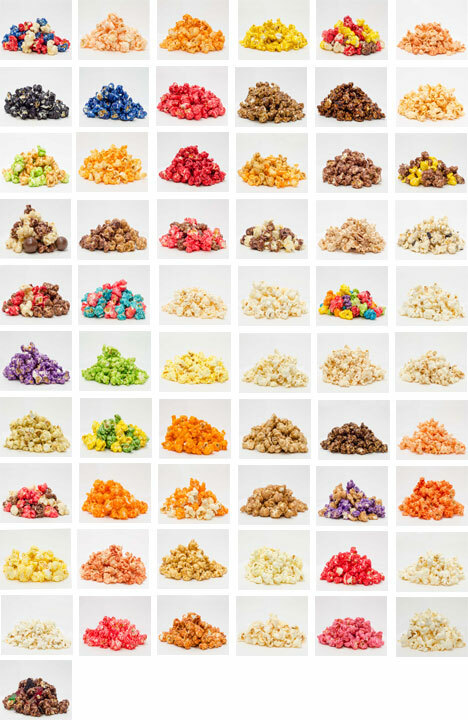 Choose your own color and flavor of popcorn, from 1-3 flavors to co-ordinate with your celebration. Get it personalized with your name, wedding date, baby info or etc with our label options pictured on the left. Choose A Template for Your Labels: 5 Templates to chose from, 2 Initials and 3 names. COLOR LABELS: Request 2 colors for the label otherwise, 2 of your popcorn colors will used on the label. Bags will be sealed and labels applied. 1 oz bag. * Special pricing available for large amounts, please call us to order and to get a quote..330.893.0139 After final approval allow 2 weeks for shipment. I purchased 40 party favor popcorn bags, and I have to say that I didn't truly taste the Key Lime flavor. Plus the packaging is not the best, as many bags break open during shipping. I will say that my guests did enjoy the popcorn.